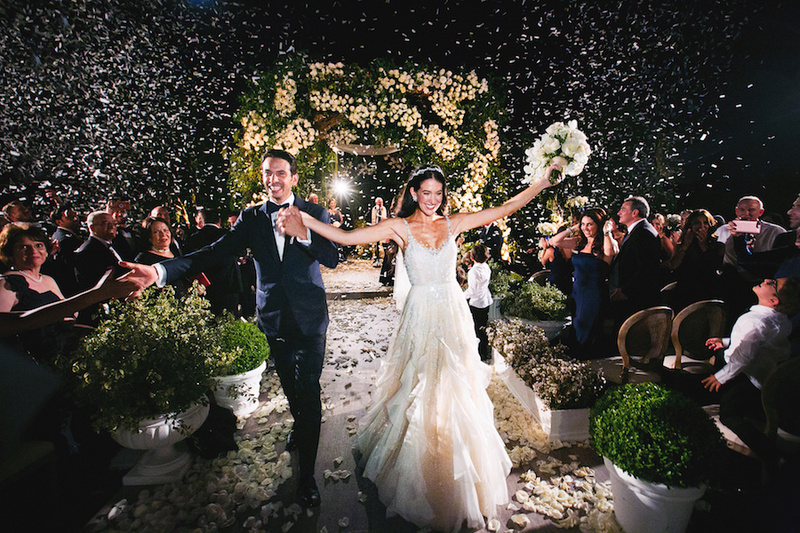 An exceptionally romantic garden wedding followed by a purely elegant reception created with an astounding design, this Four Seasons Westlake wedding is simply unforgettable. 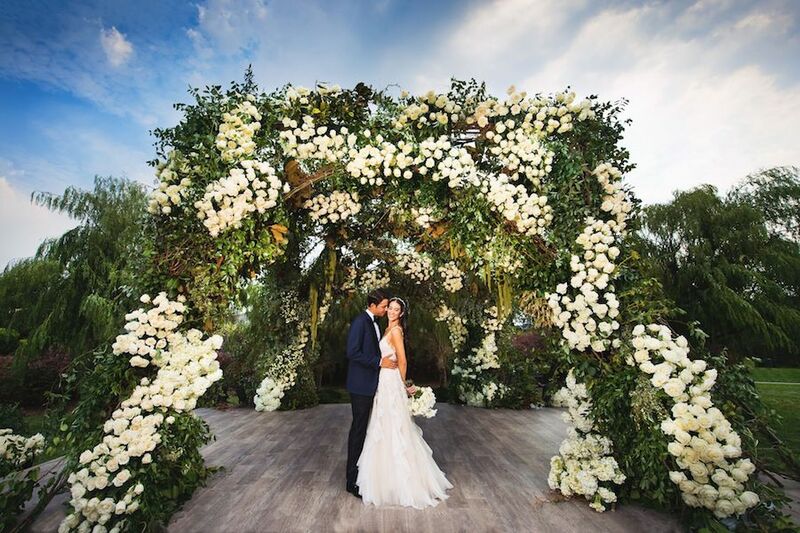 As guests entered the rose garden which led to the ceremony, friends and family sipped on champagne and nibbled on canapes while listening to a string orchestra from West Coast Music. 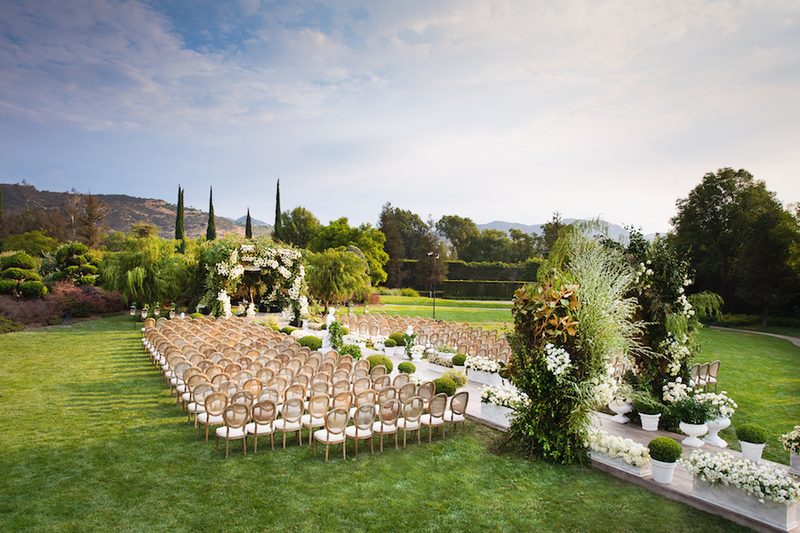 Soon after, guests found their seats in the garden in hopes to catch the best view of the bride and groom. The ceremony aisle was lined with antique pots filled with alternating blooms and flowering greens, and begun beneath a lush floral arch. 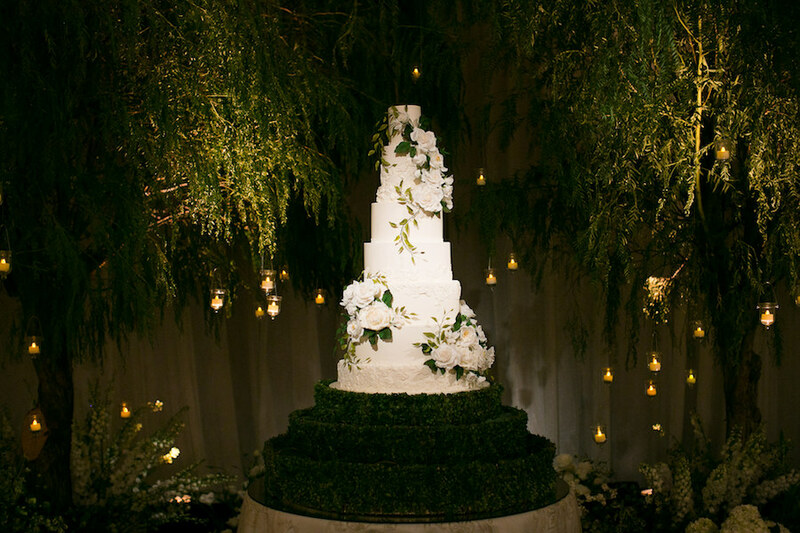 The 120’ wooden aisle was filled with cream flower petals and featured a hand painted monogram in the center. 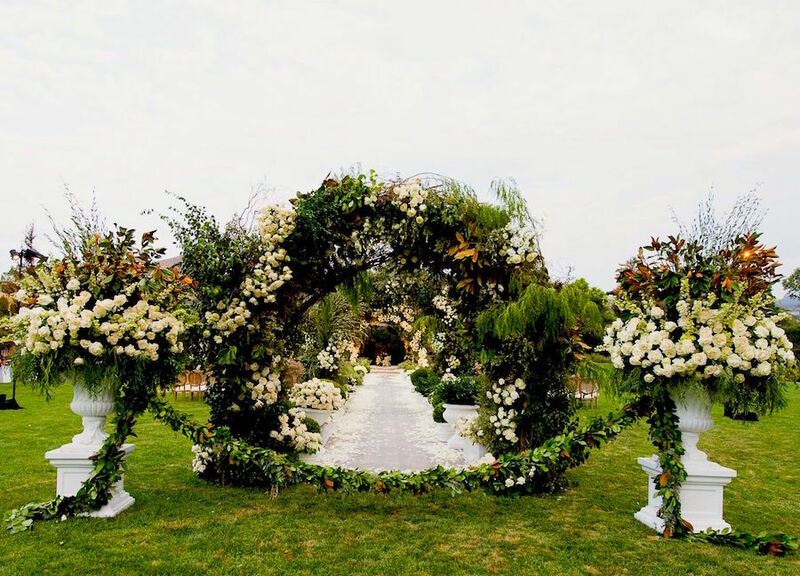 The impressive chuppah designed by Nancy Kaye of Mark’s Garden was composed of many types of lush greenery as well as white and cream roses and white hydrangea. The vision of the sun setting over the mountains as our bride and groom exchanged vows, was simply breathtaking. 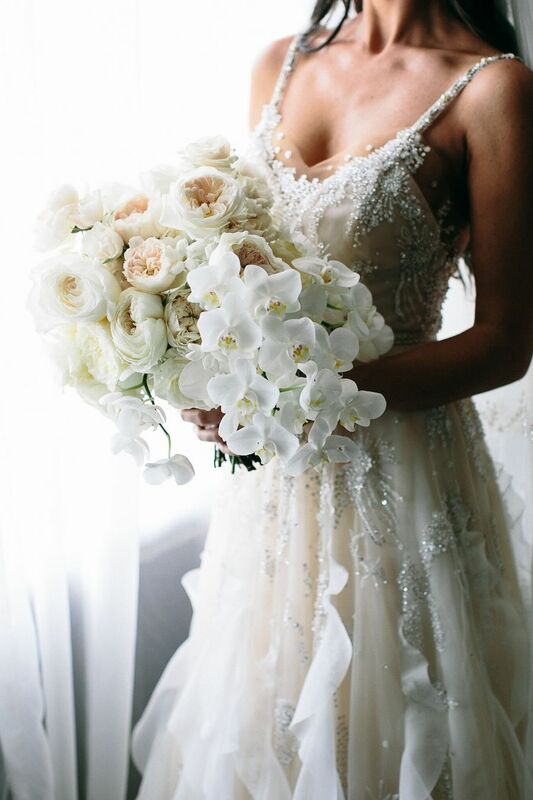 At the close of cocktail hour, the ballroom doors opened and guests gasped with excitement over the incredible sight. 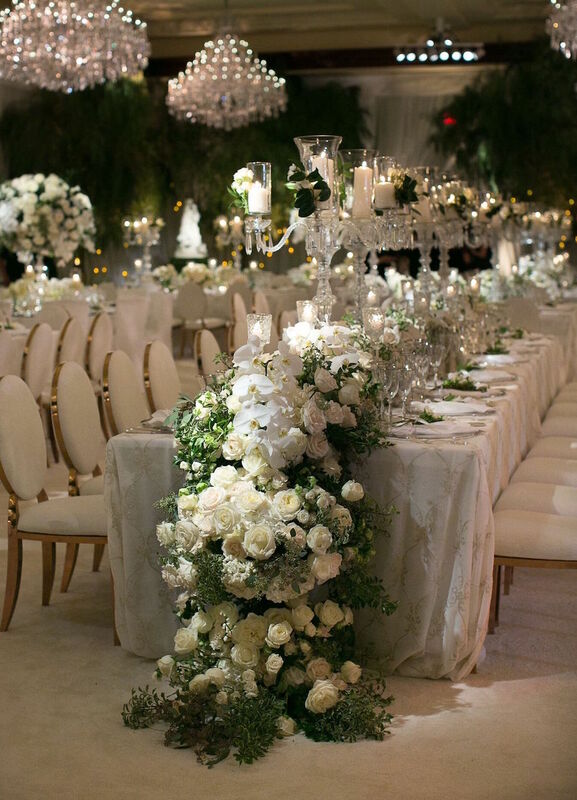 The reception was draped in a white woven fabric, with oversized pepper trees and glittering crystal chandeliers, framing the room. 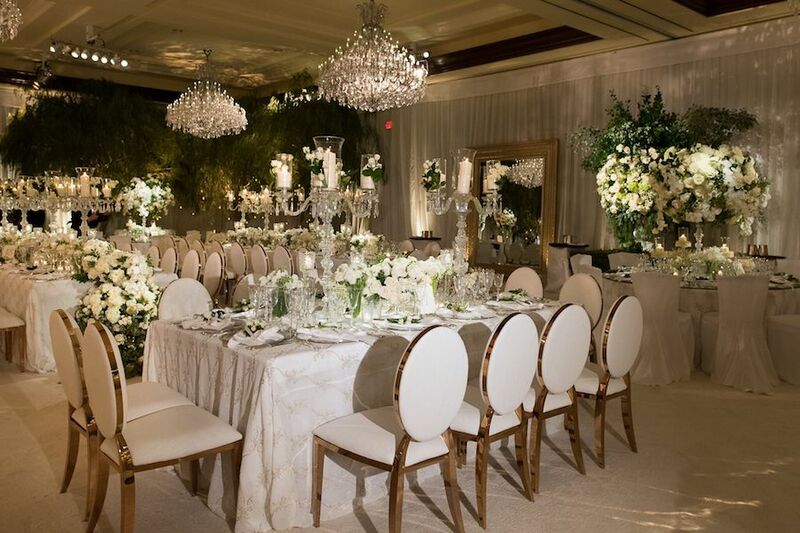 The ballroom held rectangle tables draped in textured white linen with silver detailing and round tables with white linen and mirrored tops. 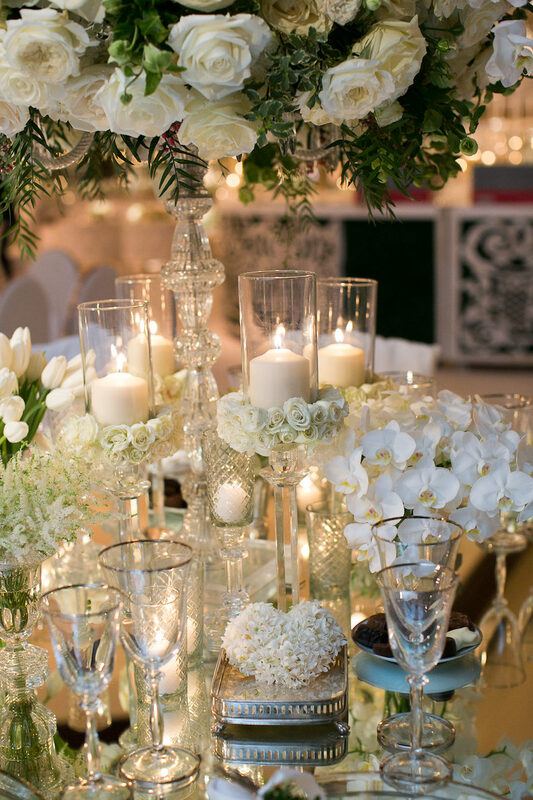 We filled the tables with uniquely styled centerpieces made up of roses, orchids, tulips as well as many other floral varieties in shades of cream, white and touches of greenery adorning towering crystal candelabras. 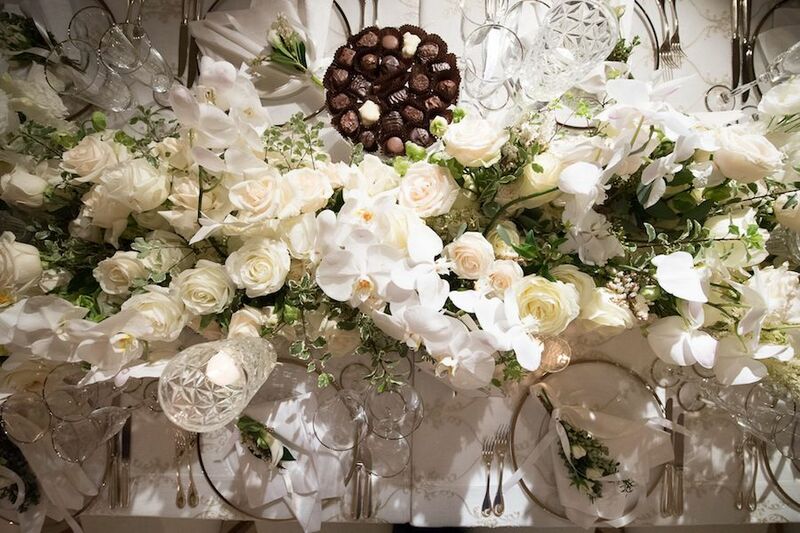 For guests with a sweet tooth each table included a tray of chocolates sitting atop a vintage crystal tray. 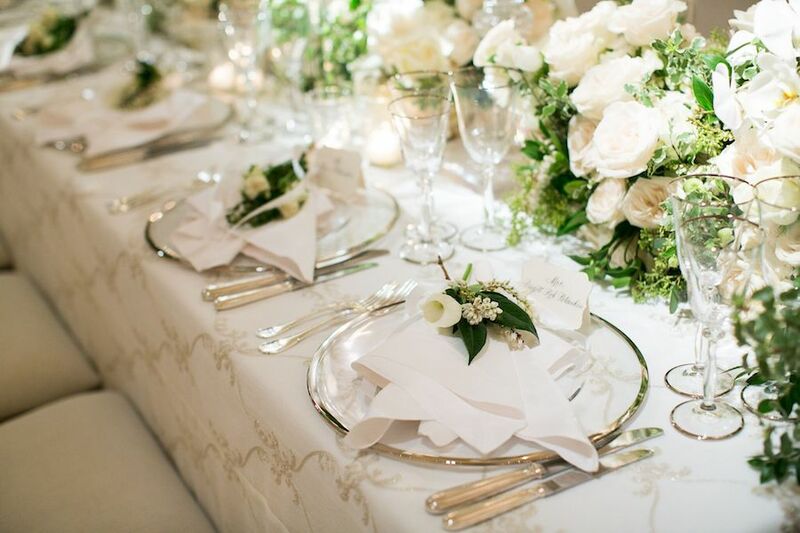 Allowing the linen to shine, we kept each setting understated with silver rimmed transparent chargers, silver flatware and elegant silver rimmed crystal glassware. 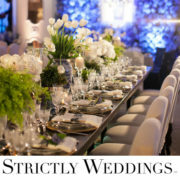 Our bride and groom entered the ballroom for the first time as husband and wife by performing the most incredibly choreographed first dance that took every guests’ breath away. What a way to begin a party! 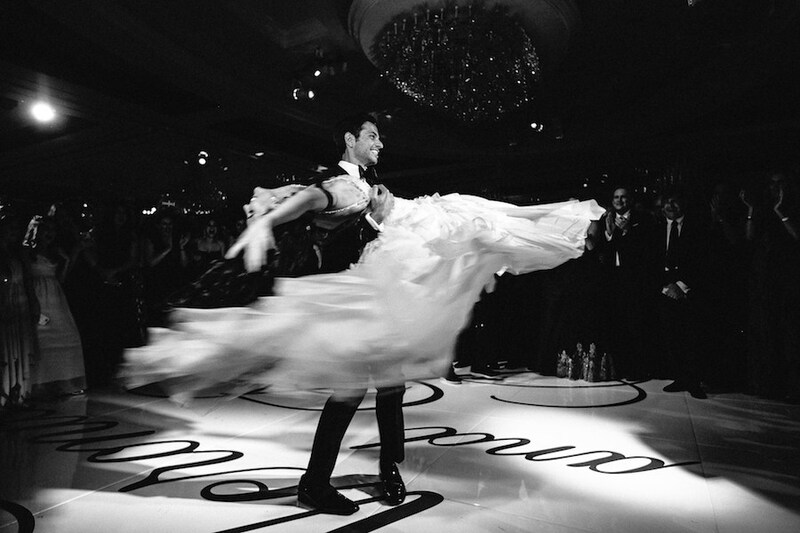 Once guests took the dancefloor there was no stopping them. Luckily they did take a short break to enjoy the amazing dinner buffets which included; Italian stations, Asian stations featuring sushi chefs, Cuban stations which included both families favorite’s and more! As the night progressed, we distributed flats for the ladies so they could dance the night away in comfort. Fun trucker hats were distributed with phrases such as, Drunk in Love, Happily Ever After and #JohnnyOnTheRoks, our couple’s wedding hashtag! For those who like to partake, we designed a cigar lounge on the terrace, where guests could relax by the fire, and enjoy custom labeled cigars and the passed desserts that came their way. As the night turned into the wee hours of the morning, guests were treated to none other than In n Out burgers! This was such an amazing evening and we are so lucky to have an incredible team supporting us to make it happen! 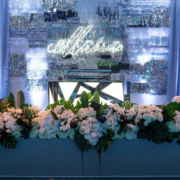 Special thank you to Callaway Gable for perfectly capturing the elegance and fun of this night!